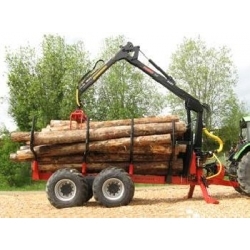 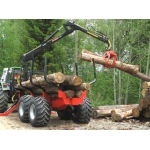 Designed for professional logging contractors the Farmi Profdrive 12 timber trailer has a huge 51 kN of traction force and a very high load capacity of 12 tonnes. 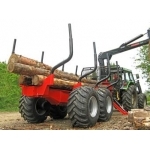 When paired with a 4 wheel drive tractor these timber trailers can match traditional forwarders for performance and productivity. 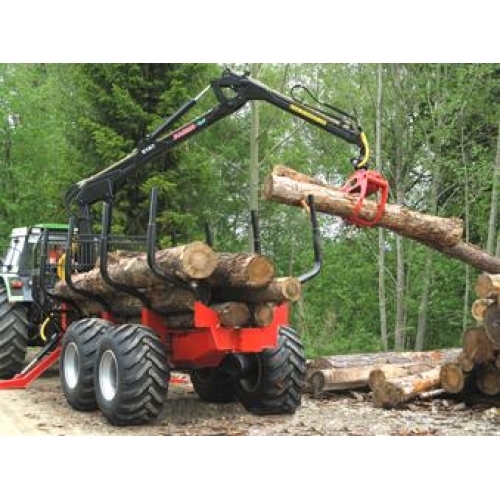 With hydraulically driven DANA shaft assembly and 54 cm ground clearance, steel reinforced 550/45-22,5 or 600/50-22,5 forest wheels and hydraulic operated oil immersed disc brakes the Farmi Profdrive 12 single beam timber trailer is designed to safely navigate all types of terrain. Each of these professional trailers come fitted with an electrohydraulic Farmi loader and its own hydraulic unit with Parker variable displacement pump, four rugged bolsters and can reach speeds of 30 km/h without 4 wheel drive, and up to 4 km/h whilst in 4 wheel drive. 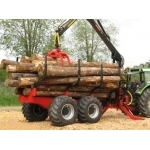 All these superb features and incredible reliability, make the Farmi Profdrive 12 combi timber trailer a popular choice amongst forestry professionals.